Imagine you have just seen your first Harry Potter movie, Harry Potter and the Sorcerer's Stone. 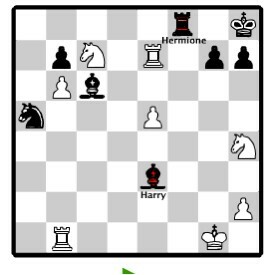 It was exciting and very dramatic, especially the scene of the chess game where Ron sacrificed himself so Harry could checkmate the White King. If you are familiar with the rules of chess, however, the movie scene doesn't make sense. This is because vital information was cut from the final version of the movie. 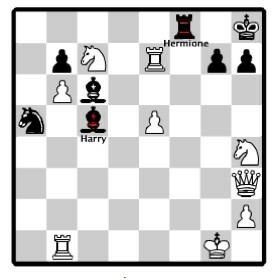 Recall from the movie, Harry, Ron, and Hermione play their way across a chessboard to pass the White players in a giant-scaled and dangerous game of Wizard Chess. 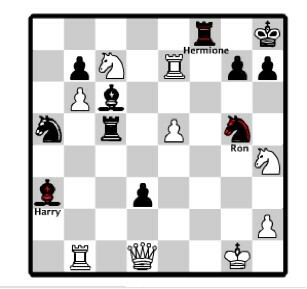 In order for our heroes to pass, they have to play deadly moves as Harry, Ron, and Hermione are part of the Black pieces as a Bishop, Knight, and Castle (Rook). Many chess pieces are smashed into bits when they are overtaken by the opponent pieces. 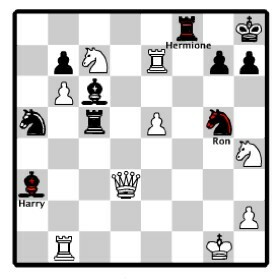 We find that in the last moves, Ron, as a Knight, has manoeuvred himself to the edge of the board as a forced sacrifice to the White Queen, since he has checked the White King. After Ron's sacrifice, Harry reminds Hermione not to move until Harry, as the Black Bishop, moves into a position to checkmate the White King, as per Ron's game plan. After watching the action-packed scene again, I noticed that something didn't quite add up. 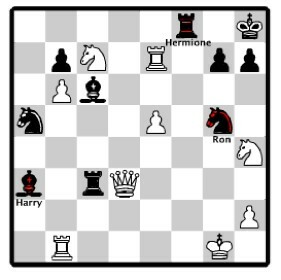 Why did Ron need to sacrifice himself when it seems that Harry could have moved in an apparent checkmate instead? If the Queen had just taken out Ron on the edge of the chessboard, why wasn't she able to prevent the checkmate in the middle of the board? Confused? Of course you are, and you are not the only one. Perhaps, like me, you repeatedly watched the scene and found that the whole last movement of the chess pieces made absolutely no sense. It is fortunate that the actual endgame itself was, in fact, well constructed even though several key moves were cut from the final version of the movie. This explains why what we end up seeing makes little sense to people who know the rules of chess. The additional moves that were cut tell an even more exciting story. Behind the scenes, and sadly not credited for the famous chess scene, was International Master Jeremy Silman. Below, he explains the actual complete chess positions and chess movement created by himself for Ron's endgame in the Harry Potter and the Sorcerer's Stone movie, but first I will introduce Jeremy Silman and provide some quick notes about chess notation. performance in an overwhelmingly strong tournament. IM Jeremy Silman has won the American Open, the National Open, and the U.S. Open. Very few players have won all three prestigious events. However, Mr. Silman is better known as a lecturer, teacher, and author of over thirty-five chess books plus a book on psychological gambling called Zen and the Art of Casino Gaming. Maxwell/Macmillan, Cadogan, and Microsoft Press published Silman's books and many have been translated into German and French. In addition, English, Dutch, German, and American magazines have featured over one hundred chess articles written by Silman. For example, Qg5 means "Queen moves to the g-file and 5th rank (square g5)." for White's move and then the abbreviation for Black's move. For example, 25.
g5 and Black's move was a Knight that took a piece on square d4. endgame for the Sorcerer's Stone movie was suppose to be. 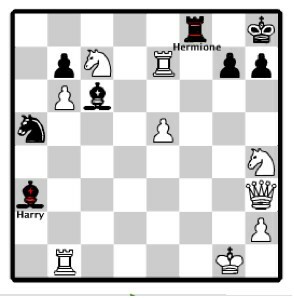 Harry is the Bishop on a3, Ron is the Knight on g5, and Hermione is the Rook on f8. Black has lost his Queen, but he has a strong attack against the White King. This eats a pawn (thereby making the producer happy!) and prevents the Knight's intrusion into h3. She also threatens to capture Harry on a3! Note that I had the Queen make the capture because I wanted to do everything possible to turn this piece into something the young fans hated. In other words, I wanted to turn the White Queen into the scene's villain. solution. Can you figure out why? away from its control over the c5-square. This is the only legal move. effort to safe its Monarch. 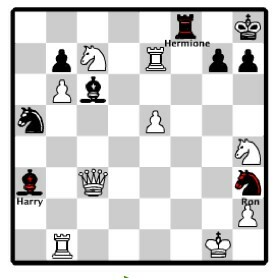 slashed to ...Nh3+ (Ron's sacrifice) and ...Be3 mate (notice that ...Be3 doesn't capture the Queen...very, very sad.) I still feel that this was a real missed opportunity and would have enriched the whole on-screen scene immeasurably. Jeremy Silman's description of the endgame paints a very graphic and thrilling scene. as the lack of expedient explanations to keep the tempo of the story moving. well-constructed details can be reduced to nonsense after the editing process. "mumbo-jumbo" for the member's of the audience who have not read the book. many Harry Potter fans to pick up chess to stimulate their minds. Potter and the Sorcerer's Stone is one such missed opportunity. 1. Copyright © 2002 Jeremy Silman. Used with permission and adapted for the Leaky Lounge and Scribbulus by WizBang 101. 3. Silman, "Harry Potter, the Complete position." Harry Potter and the Sorcerer's Stone. Directed by Chris Columbus. Burbank: Warner Bros. Pictures, 2001. Silman, Jeremy. "Harry Potter, the Complete position." WWW.JEREMYSILMAN.COM: Exploring the world of chess, movies, and beyond. 2002. http://www.jeremysilman.com/movies_tv_js/harry_potter.html (accessed on January 30, 2009). ”””. Zen and the Art of Casino Gaming. Summit Pines Press. 1996. Wikipedia: The Free Encyclopedia, s.v. "Chess." http://en.wikipedia.org/wiki/Chess (accessed on January 30, 2009).